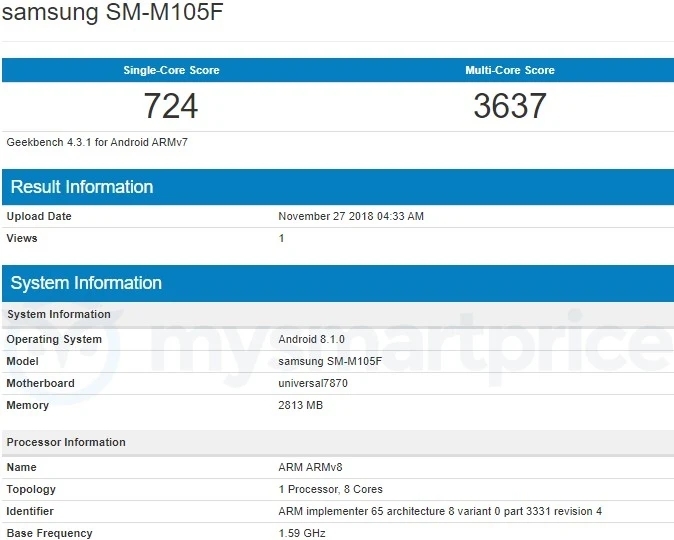 As revealed by Geekbench, the Exynos 7870-driven Samsung Galaxy M10 (SM-M105F) might just be the lowest-end model of the upcoming Galaxy M family. Its specs also include 3 GB of memory and 16 GB or 32 GB of internal storage space (two distinct models). The unit tested on Geekbench runs Android 8.1 Oreo. Samsung will soon spice up its low-end and mid-range offerings with the Galaxy M lineup, which promises to be quite interesting. For now, we still have to live with rumors and leaks, but since the first benchmarks have been spotted online already, the Galaxy M handsets might be closer than expected. Today, the time has come for the Galaxy M10 (SM-M105F), apparently the most basic model of the family. The Geekbench scores of 724 (single-core) and 3,637 (multi-core) are nothing to be amazed of. The specs of this device include the octa-core Exynos 7870 processor, 3 GB of memory, 16 GB and 32 GB internal storage (apparently both models will come with the same amount of memory), but only Android 8.1 Oreo. Since this Galaxy M is expected to replace the Galaxy J5 and Galaxy J7, maybe Samsung will also put an ambient light sensor on it and drop the rather awkward selfie-shooting brightness adjusting technology. The Galaxy M10 (SM-M105F) is expected to be accompanied by two more powerful siblings, namely the SM-M205F and SM-M305F. 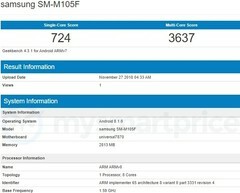 The SM-M205F was spotted on Geekbench as well with an Exynos 7885 onboard, next to 3 GB of memory. The SM-M305F is rumored to feature up to 128 GB of internal storage. If the rumors turn out to be accurate, these two models will hit the market as the Galaxy M20 and Galaxy M30. Next year will surely be a very interesting one for the tech giant based in South Korea and the fans of its mobile business, but all these name changes could be a bit confusing for those used to the old families of Samsung handsets. Do you think that Samsung should keep its existing Galaxy A and Galaxy J families around? Let us know in the comments.